Note: Good Morning! Reading -16F at the airport this morning…brrrrr! I’m skiing The Sliver on Nez Perce today with Dustin Lemke. 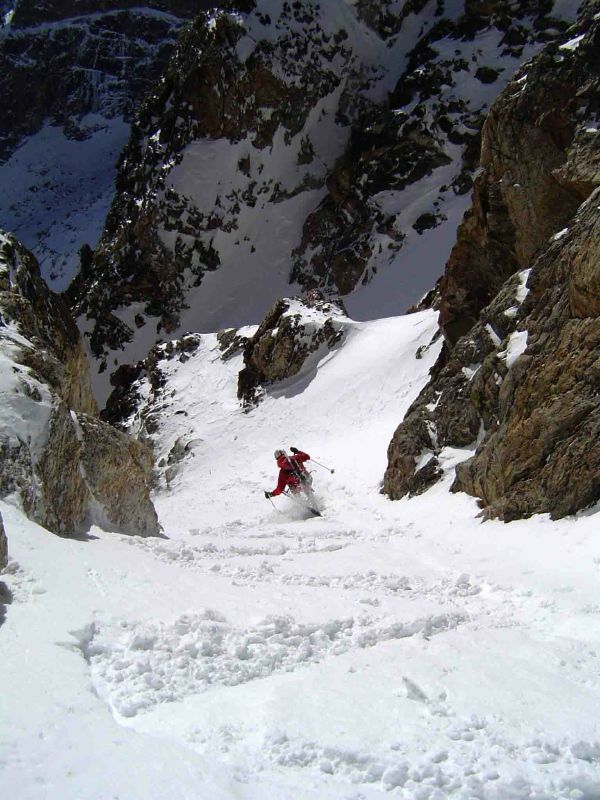 This is a TR from a great trip skiing the main South Couloir of Teewinot on December 17, 2004. Having found good coverage in the mountains lately, I figured a larger objective, the South Couloir of Teewinot, was in order. An early wake-up call brought us to the Taggart Lake trailhead before sunrise and an hour long skin on barely covered meadow grass brought Reeders and I to the first designated stop we often have when skiing into Glacier Gulch. The junction where the Valley Trail meets the Garnet Canyon Trail is typically our breakfast spot (this spot is totally avoided in summertime though) before the grunt up to Delta Lake. A cool sunspot appeared on the East Face of The Grand Teton when we got to Delta Lake and I think it was an omen of things to come. Steep skinning up the moraine of Teton Glacier brings you to a point where you can then head right towards the south couloirs of Teewinot. A more direct approach can sometimes be made north of Delta Lake when there is more snow, but you must scout the route prior, as there are a few options. As the snow got softer and deeper, we slowly made our way back to the east. 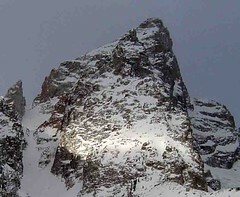 There are a few shots that lead up to the south ridge, but the one with the big chockstone at the top is the main South Couloir. At one point we opted to climb the rock on the side of the couloir, since it was easier than breaking trail through the deep fluff. We reached the chockstone and were able to climb underneath it to the upper wind scoured slopes…cool! This would be where we begin the descent. Stomping out a platform below the chockstone gave us a feel for the steepness of the line…and it was quite steep. An easy 50° and very tight, this would be a lesson in ‘kung-fu turns’. The power was soft and sweet, and it made the steep turns ever so graceful. We zipped it up one right after another and loved it as the terrain opened up allowing for bigger turns and faster skiing. 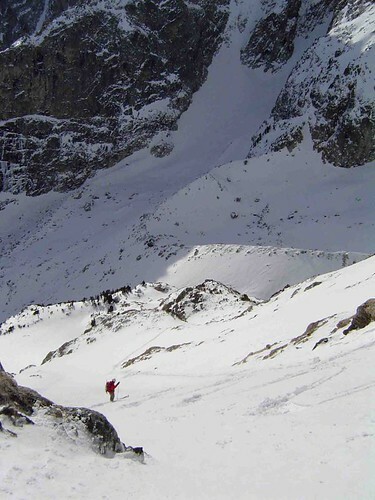 Not sure of the conditions of the direct line to Delta Lake we banged a hard right to the slope we had ascended. 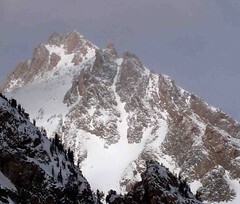 Good skiing was found on the lower flanks of the moraine where half the time it is just marginal. Searching for the deepest snow while hearing multiple whumps in the thin snowpack below the lake, we made it down to the valley quickly. I had some kick wax in the pack, so we greased up our bases to speed up the trip across the flats and back to the rig. Man, what a great early season descent…score!